Nestled in the foothills of the Carpathian Mountains of Galicia in southeastern Poland lies the small town of Kañczuga. Most travel guides neglect to mention this community in their regional descriptors, and it rarely appears on any maps. Yet, its place in the history of the Holocaust and its connection to a past I never knew created a large and alluring reference point for me during a recent visit to Poland. Asked to accompany a former colleague, Sam Intrator, and his brother, Mike, on a research trip to chronicle and survey different forms of remembrance of the Nazi Holocaust in Poland last September, I welcomed the opportunity to visit Kañczuga, the hometown of my great-grandfather, Abraham A. Brill, for the first time. For a week, the three of us traversed the topography of Nazi terror. Beginning in the streets that once outlined the Warsaw ghetto, we spent our time confronting the ugly reminders of a horrid history at sites like Chelmno, Treblinka, and the small town of Gombin, a community 60 miles west of the capitol that members of Sam and Mike's family had called home for several centuries before 1941. Cracow and Auschwitz-Birkenau followed before we headed east toward Kañczuga, Lublin, and Majdanek. At every juncture, we wrestled with the "rules" and methods of remembrance. Here we were, three Americans with distinct Jewish heritages linked to rural Polish villages driving an expensive rented automobile to death camps, massacre sites, and long neglected cemeteries in a nation struggling to overcome decades of communist economic inertia, and environmental and cultural neglect. What did we hope to find at these places of murder anyway? Should we react with scorn and judgment, painting Poland and Poles with the broad strokes of self-righteous indignation and disgust for politicizing the Holocaust as a violation of Polish and not Jewish lives? Should we be more aware of the centuries of rich, Polish culture and history rather than focusing on almost 6 years of German occupation that rendered Poland a nation virtually free of Jews? Would we be caught up in the wave of "new" Jewish tourism beginning to flourish in the wake of Steven Spielberg's "Schindler's List" where visitors flock to sites from the film, faux Jewish restaurants and shops to spend lavishly on icons and souvenirs of a world expunged? Answers to these and other inquiries did not come easily. Throughout the week, we met with dignitaries, directors and deputy directors of historical societies and Jewish research institutes to discuss our findings and nagging questions. We also spoke with artists, religious leaders, and those committed to recalling a vibrant Jewish community effaced by the Holocaust. These individuals encouraged and prodded us to pursue our journey with vigor and an attitude of understanding and openness. However, by the time we reached Kañczuga, cynicism was eroding our sympathy, and our patience, having been dulled by a lack of sleep, several ugly encounters with anti-Semites, and an overwhelming sense that the heinous crimes committed by the Nazis lay buried beneath the surface of virtually every city and town we passed through, was ebbing quickly. According to the Central Commission for the Investigation of Nazi Crimes in Warsaw, during the six years of German occupation, over 5,700 camps and ghettos were established by the Nazis in Poland. Systematic executions occurred in these camps and ghettos as well as in hundreds of cemeteries, synagogues, forests, fields, barns, and village and city centers across the nation. How many sites of murder and terror had we passed and not even noticed? If these traces of the Holocaust are erased and covered up with time, development, or neglect, how could we begin to imagine what this lost world of Jewish communities once looked like? Is memory the only monument left to those who perished? We needed to look no farther than Kañczuga. 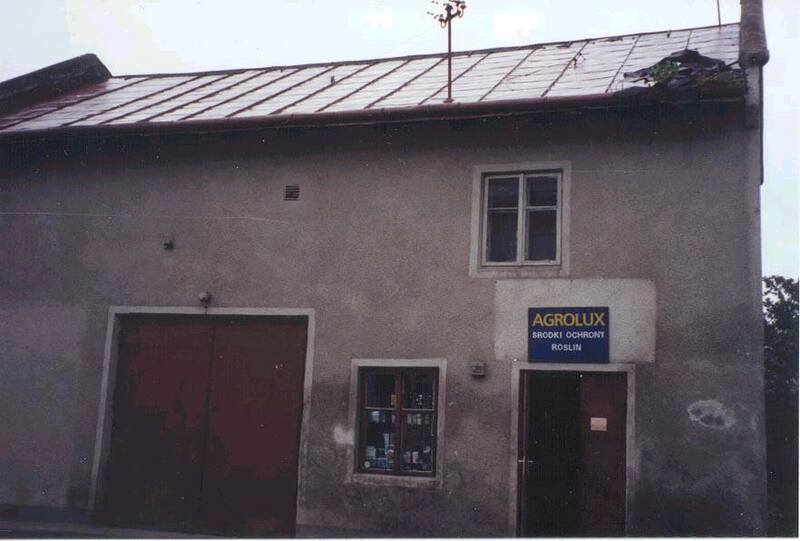 Situated south of the old Cracow-Lemberg (L'vov) Road, we drove into a farming town that appeared to have changed little since the war. An imposing Catholic Church and cemetery dominated the approach to the center of town from the main road. Rays of the noonday sun were slowly choked off by the dark, windswept clouds of an onrushing summer rain shower, and the few people that were outside hustled to find shelter. In the main square, a monument depicting a mountain with an eagle perched atop the summit detailed the nations and regimes that had control over the town throughout its history. Like much of Poland, Kañczuga experienced periods of revolving national affiliation, and it was under the flag of the Austro-Hungarian Empire that my great-grand father was born near the end of the last century. As a teen, he emigrated from Kañczuga to the United States where he put himself through school and became a psychoanalyst and colleague of Sigmund Freud. In this capacity, he was the first to translate Freud's works into English, as well as the first to use the word "Holocaust" in reference to the actions of the Nazis when writing the introduction to The Basic Writings of Sigmund Freud, a collection he had just translated and edited in 1938. Yet, in spite of his academic and professional success, his connections to his hometown did not grow more distant with time. I came to see if any of these connections were still visible, and to learn the fate of the relatives he left behind. We parked in front of the sign of the town seal. How odd to have a seal with a prominent yellow star of David emblazoned in the center of a blue shield. I walked toward a building identified as the library while Sam and Mike took photographs of the square. Inside the well-lit one-room library sat a man of about 50 hunched over a reference book. A young boy read a picture book on a corner stool. In my best attempt at Polish, I asked where the Jewish cemetery was located. The man responded that the town of Kañczuga had no Jewish cemetery. I produced a map of former Jewish communities I obtained from the Jewish Historical Institute in Warsaw to show that there was both a cemetery and at least one synagogue in this community. Shocked, he picked up the phone and called someone. He understood neither English nor German and when he replaced the receiver, he tried as best to explain something to me . By this time, Sam and Mike had returned. Within minutes of their arrival, a woman near the age of the librarian entered and asked to see the map. She too appeared shocked and beckoned us to follow her. Her language skills in German were somewhat better and she told us we would meet a man who could answer our questions. Passing through the small tree-lined square with a fresh carpet of lawn that would make many suburban Americans jealous, we entered an old two-story building across from the library, and climbed over boards in a dark passageway that opened into a small courtyard. Opening a door before us was a tiny elderly woman with a face like an apple doll. Her apron tied tightly around her waist, she exuded warmth and confidence. Behind her stood another woman around the same age, her gray hair tightly wound in a bun and wearing a similar apron, and a man over 70 who had just changed out of his work clothes and into a neatly pressed pair of slacks. Several young children poked their heads from behind the curtains of this comfortable apartment as we made our first formal introductions in German to the Knuprinski family and their friends. I asked about the cemetery, synagogue and knowledge of the Brill family. At the mention of Sara Malka Brill, my great-grandfather's sister, the three older people in the room became quite animated. Polish sentences flew from one to another while we sat dumbfounded. They all knew this woman, her husband, a klezmer musician, and their family. They had lived just down the street. Only they were murdered by the Nazis. Mieczystaw Knuprinski had been there. Silence. Did we hear that correctly? What did he say? While we struggled to press him for the details, one of his granddaughters arrived. A 10th grader home from school for lunch, Magda had taught herself English by watching American films, and studying from a book she bought through the mail. She wants to be a teacher or translator of English someday, in contrast to many of her friends who aspire to be models and actresses. Following an exchange of small gifts and details about our lives in the United States and our journey through Poland, we pressed Mr. Knuprinski on this astonishing information about the murder of Jews in Kañczuga. Against the mild protests of his wife and her friend that it was too wet, Mr. Knuprinski told us through Magda that he would show us the cemetery and the sites of the murders. As we left the apartment, Magda told us she had never even known there were Jews in her home town. Yes, she had learned about the Holocaust in school, but never in reference to the very community in which she was growing up. We asked Mr. Knuprinski about the star of David in the town seal as we squeezed into the sedan. Magda said it was not even a Jewish symbol, but Mr. Knuprinski calmly told us that, prior to the German invasion, 80% of the town was Jewish, and that it had been a lively Shtetl (small Jewish town) for centuries. If that was the case, why didn't Magda even know? What happened to these people and their belongings? Why were there no markers or memorials remembering the lives of those annihilated in 1942? Mr. Knuprinski related that the two buildings facing each other had been the old and new synagogues. One of the rabbis lived in the house that now served as a small grocery store. One block from the synagogues, Mr. Knuprinski noted that the house on the left had been the home of Sara Malka Brill Reizfeld. At a place in front of her house, over 100 Jews had been shot. Across the street, over 1000 Jews, including the elderly, women, and children, were gathered where a Ferris wheel now stood, and marched to the top of a nearby hill to be executed. Mr. Knuprinski asked us to pull off the road and begin the ascent of this hill along a muddy track that wove through a corn field. Within moments, we arrived on the crest of a hill overlooking a rolling patchwork of fields below. A small, but dense, stand of trees and shrubbery crowned the hill. Dozens of tombstones stuck out of the earth within these trees like rows of abscessed teeth. Underneath deep glass and nettles, many gravestones lay toppled and exposed. Moss, lichen, and fissures in the stones made a number of them difficult to read. There was a dread suffocation of sound and we proceeded to investigate the site in silence, our collective thoughts punctuated only by an occasional raindrop. Amid the peaceful rustling of trees, the depth of the horror was difficult to fathom. After saying kaddish, the prayers for the dead, we again asked Mr. Knuprinski what he meant when he said he had seen these murders. In a melancholy voice, he related that he had hid in the hay loft of a barn across from the Brill-Reizfeld home in order to avoid a forced round-up of able bodied Polish boys for some type of work detail. From an opening in the loft, he witnessed the first killings and round-up. He saw the Jews marched up to the cemetery and heard the shots. When he came out of hiding, he saw the burial details covering the bodies. Hundreds of the stones had already been used to pave nearby roads and the bodies were dumped in a long row where grave markers had been. After this time, he never saw another Jew in Kañczuga. On our short drive back to the Knuprinski residence, Sam noticed anti-Semitic graffiti painted on the wall of the building that once was the new synagogue and the Jewish school. A star of David and the word "Yids" appeared next to the side entrance. Throughout our journey, we had seen a great deal of anti-Semitic graffiti. The presence of such epithets was an assault on our sensibilities. Why do people leave it up? In a town without Jews, what is the purpose of these slurs scrawled for all coming into town to see? Neither Mr. Knuprinski nor Magda had an explanation or comment. Each of us sat in a brief world of private reflection where our individual confrontation with history created a clash between the intellect and the emotions. After an emotional farewell, we headed towards the car and walked several times through town to take additional photographs. Apparently, our actions attracted attention, and a number of men began to gather near the place where we were parked. From the way they looked at us, we got the distinct impression that it was time to leave. As the clouds began to disperse, and the afternoon sunshine returned, we left this group behind, and departed a pastoral landscape that covered a small, but horrific series of events in the annals of Holocaust history. On our way to Lublin, we decided not to head to Sobibor and Belzec. We were saturated. We had enough for one day. Yet, as the distance from Kañczuga grew greater, and our discussions returned to the events in these little Jewish villages, we asked each other many questions. How does one salvage lives that have been shattered? What documentation or other eye-witness testimony exists in archives that chronicles the atrocities which took place at these locations? If there are Einsatzgruppen reports from places like Ukraine, Crimea, and the Baltic states, what was done to report on the murders carried out by the Germans in Poland? How accessible is this information? In addition, what is being done to commemorate and preserve the sites, documents, and relics that comprise the topography of terror in Poland? Do they deserve the same degree of attention, remembrance, and reflection as major camp memorials like Auschwitz-Birkenau? How can these sites be accessible to people in a manner that avoids creating a Disney theme park environment, or becoming so innocuous that the history of the Holocaust languishes as a mere footnote? While it will take months to address the depth and scope of these questions, this journey to Kañczuga and Poland enabled me to gain access to an event and a place that once appeared unapproachable, and helped illuminate and apprehend that which my mind has for so long struggled to conceive. I look forward to the possibility of returning someday, and continuing this pursuit of unanswered questions and unresolved issues relating to the Nazi Holocaust in Poland.